alking in Provence is understandably a very popular activity due to the Region’s rich cultural heritage and an array of favourable features for visitors: an amenable climate propitious for all-year-round walking, diverse walking trails and, last-but-not-least, its highly-reputed Mediterranean cuisine based on the olive, fig, fish and Walking in Provence – Pont du Gard Walkingfine wines. The Provence of Classical Antiquity stretches as far east as Ales, gateway to the Cevennes, whilst its most sought-after locations are to be found in and around the Rhone Valley: the cities of Avignon, Nimes and Orange and their hinterlands, including one of France’s most-visited ‘Grand Sites,’ the majestic Pont du Gard. Walking in Provence is for those who enjoy gentle walks, fine cuisine, staying in traditional stone guest houses and plenty of local insight into the areas through which you hike. If you plan to go hiking in France only once, Provence is likely to be your preferred destination. 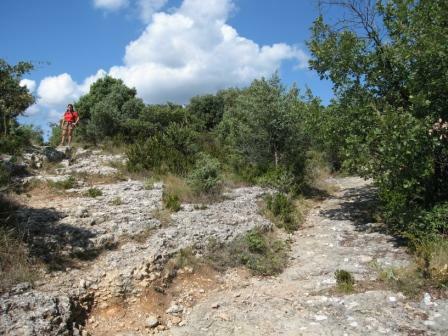 What follows is an appreciation of walking Provence based on its ‘natural’ regions. The regions that our discussion covers are the following: Camargue, Nimes & its Garrigues, Valcèzard, The Gorges du Gardon, the Mountains of Provence and The Calanques. Provence walking tours of a light genre can be enjoyed in Camargue, an area of over 930 km² (360 sq. miles) and western Europe’s largest river delta. It is a vast plain comprising large salt lagoons or ‘étangs’, cut off from the sea by sandbars and encircled by reed-covered marshes. These are in turn surrounded by a large cultivated area. France produces forty per cent of its own rice and all of it is grown in The Camargue. Do try it and take some home with you – and why not cook it using the local salt made in Les Salins du Midi? Many readers will be familiar with the Roman city of Nimes or ‘Nemausus’ with its fine Roman architecture, extraordinary gardens and rich history. Located on the Mediterranean’s fertile coastal plain that runs in a parallel band from north-west Italy to north-eastern Spain, fewer will be conversant with this area of undulating lowland itself, so multi-faceted that the locals refer to it in the plural – Les Garrigues. This sweeping area of low-altitude limestone terrain boasts picturesque countryside and fine trails that can assist you in discovering the region’s rich culture and history on foot. Walking its undulating topography makes for the ideal, gentle hiking tour that you can enjoy all year round either on your own or in the company of friends and family. And don’t think the terrain is flat. 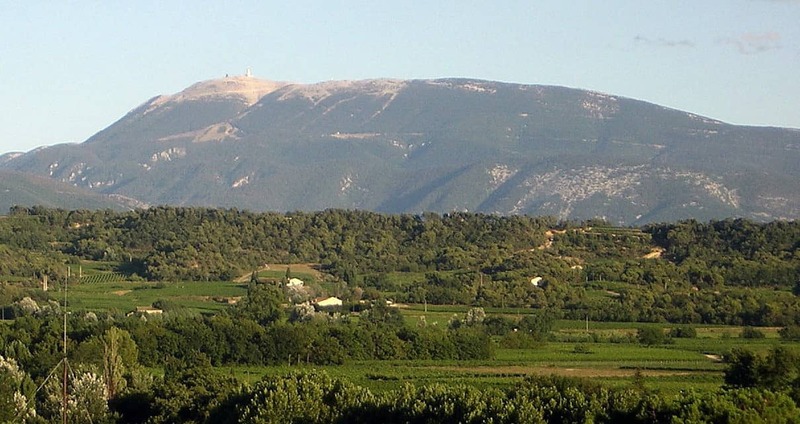 Similar in shape to Mont Ventoux, Mont Bouquet stands at 629 ms (2,063 ft) and towers above the Garrigues half-way between Nimes and Ales. Wherever you are in Garrigues, its omnipresence is a welcome reassurance. This is a territory that boasts a rich and sometimes tragic history that is traceable back to Roman times and beyond. Since then the area has been subjected to invasion by Visigoth and Saracen, Crusader and, more recently, Nazi. In between early Pilgrims and traders passed from northern to southern Gaul along the St Giles Way as too did the ideas of the Reformation that hastened in much conflict in the form of the Camisard rebellion. The best trail to learn more about the region’s history has recently been re-launched and baptised The Regordane. Trails of the French Garrigues. Provence walking at its best is to be found in the land lying between the Valley [Val] of the Cèze [Cèz] and the Ardèche [Ard] – a fascinating territory indeed. Its geographical location and cultural roots naturally predispose it towards Provence rather than Languedoc; and its relative isolation means it remains an under-explored sector of a generally overly-commercialised and developed greater Rhone Valley. Whether you enjoy gorge walking, hopping from hill-top to hill-top village or following man’s Megalithic footprint, Valcèzard is an ideal corner for some light and enchanting hiking. Or you can double up on some days and enjoy more of a moderate challenge whilst hiking the same trails and footpaths. Walking Provence-West is the trip title and the wine, like the accommodation, is very much AOC. For Provence Walking tours purposes, we consider the Maritime Alps as part of Provence. They thus form the highest peaks in the ‘Region’ – Cime du Gélas is 3135 ms or 10286 ft and Mont Pelat measures 3053 ms, 10017 ft.
Outside of the Maritime Alps, Mont Ventoux (1909 ms or 6263 feet), is the highest peak in Provence and great hiking territory. Whilst geologically part of the Alps, it is considered to be separate from them due to the lack of any intervening mountains of similar height. Located 20 km north-east of Carpentras, it is nicknamed “The Bald Mountain” as its ‘table-top’ is bare, white limestone bereft of flora. This gives it an all-year-round snow-capped look, whereas snow cover actually lasts from December to April only. For shorter Provence walking tours, The Alpilles is perfect. A mountain-chain about 20 kms south of Avignon, the landscape is one of arid limestone peaks separated by dry valleys. Although not particularly high, measuring only 387 m (1,270 ft) at their highest point, they rise abruptly from the surrounding Rhône valley. Montagne Sainte-Victoire is probably the best-known mountain in Provence, thanks to Paul Cezanne, who painted it frequently. It is a limestone ridge extending over 18 kilometres, with its highest point, Pic des Mouches, lying at 1011 metres (3316 ft). Les Calanques are a dramatic feature of the Provence coast, a 20-kilometre-long series of narrow inlets in the cliffs of the coastline between Marseille, to the east, and Cassis to the west. The highest peak in the massif is Mont Puget at 565 metres. There are some fine hiking trails to explore along the coastal strip, on either short hiking tours or as part of a longer walking holiday in France. 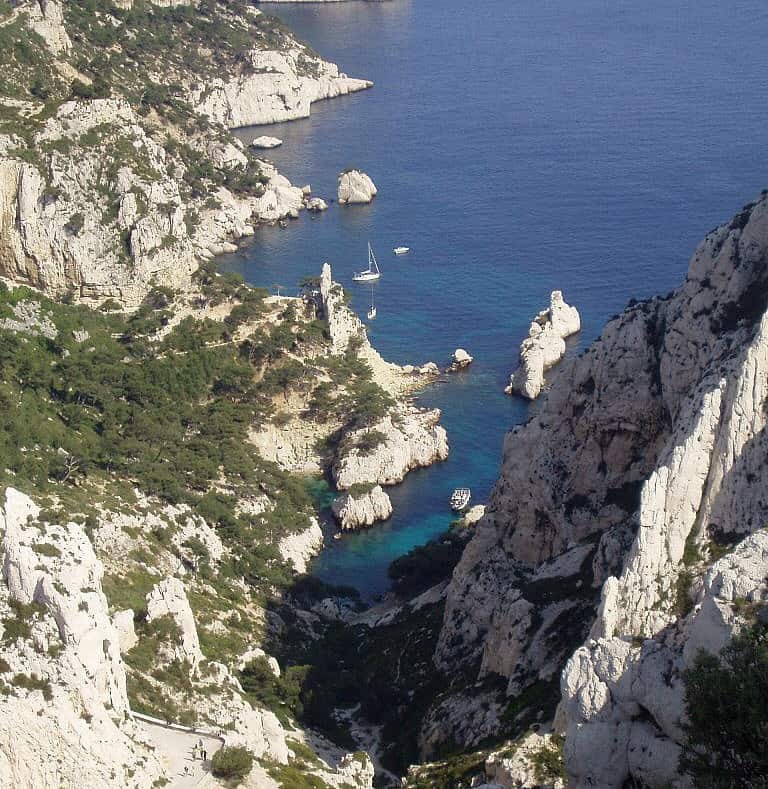 Calanques are remains of ancient river mouths formed mostly during the Tertiary Period. They were further deepened by glaciation and then flooded by the sea to become ‘calanques’. Walking in Provence: but where does it end? When walking in Provence France, where will you actually go? Administratively, of course, there is no region called Provence, but instead a tessellation of six departments in the south-eastern corner of France that comprise the rather eclectically sounding Provence-Alpes-Côte d’Azur, or ‘PACA’ for short. Only one of these departments actually uses the word ‘Provence’ in its name – that of Alpes-de-Haute-Provence which, by implication, presupposes the existence of a Basse-Provence; the latter being Var and Bouches-du-Rhone. Walking in Provence’s eastern ‘frontier’ would, quite literally, take you to the border with Italy. Nothing controversial there, then; whereas just where lies the westernmost boundary of Provence is undeniably contentious. Formed by the Vaucluse, where one finds the emblematic cities of Avignon and Orange, the administrators’ decision to use a geological divide [The Rhone River] to delineate a cultural frontier was surely an error. As if both justified and symbolized by the remains of the ancient Pont Saint-Bénézet, the decison was taken to place modern Provence’s eastern frontier contiguous with the line that formerly divided The Papacy from the then French State. A Provence walking tour with The Enlightened Traveller would perfectly demonstrate the absurdity of this partition as our programme takes you from the right to the left bank the Rhone, and from Fort Saint-André in Villeneuve-lès-Avignon [Languedoc-Roussillon/Le Gard] to the Pope’s Palace in Avignon itself; each seemingly a mere stone’s throw away from the other and architecturally very much from the same era. Furthermore, when you consider that just 38 kilometers south west lies another bastion of the Roman Empire, Nemausus or Nimes, then you begin to realize why enlightened travel guides tend to include the eastern half of the department of Le Gard under the ‘Provence’ banner, referring to it specifically as Gard-Provence or Provence-Gardoise. The French tourist boards love anything with a Roman association and so Nimes, the capital of the Gard, actively pushes the orthodox boundaries westwards in order to gain the extra kudos that flows from belonging to Provence. It is also true to say that the French living in this area associate themselves more naturally with Provence than with The Languedoc or The Cevennes. However, there is much snobbery involved here, not to belittle the financial benefits to be gained from the association. Yet the ‘pull’ is by no means mono-directional, as the ‘Feria’ and Hispanic tauromachy bears testimony. Provence owes its name to the fact that it was the first Roman province outside of Italy. Nevertheless, Provence has been inhabited since prehistoric times, with Paleolithic sites dating back to 900,000 B.C. Two centuries before the birth of Christ, Roman legions entered Provence on three occasions to repel and suppress aggressors and from 125 B.C the Romans decided to establish permanent settlements in Provence. Roman Province was called Narbonensis, after its capital, Narbo (modern Narbonne), and extended all the way from Italy to Spain, from the Alps to the Pyrenees, thus comprising the modern region of Languedoc-Roussillon as well. Aix-en-Provence was founded in 122 B.C, and other new cities included Arles, Nimes and Orange. The Romans then began building roads to facilitate troop movements and commerce between Rome, Spain and Northern Europe, the Via Domitia being the most important of such routes, which many hiking France today still enjoy. In 8 B.C., Emperor Augustus began to Romanize Provence politically and culturally and Roman engineers and architects built aqueducts, arenas baths, monuments, temples, theatres and villas, many of which still exist today. No France hiking CV is complete without a hike to the celebrated Pont du Gard. This is best done out of season and by avoiding the tourist entrance, so why not make it your grande finalé by participating in our Hiking Provence-Gard tour? The ‘Pax Romana’ in Provence lasted until the middle of the 3rd Century, when Germanic tribes invaded Provence in 257 and 275. At the beginning the 4th century, the court of the Roman Emperor Constantine (280 to 337) was forced to take refuge in Arles. By the end of the 5th century, Roman power in Provence had vanished, and an age of invasions, wars, and chaos ensued. Most of Provence has a Mediterranean climate, characterized by hot, dry summers, mild winters, little snow and abundant sunshine. Within Provence there are micro-climates and local variations, ranging from the Alpine climate inland from Nice to the continental climate in the northern Vaucluse. Lovers of Provence walking tours recognise that the winds of Provence are an important feature of the climate; particularly the Mistral, a cold, dry wind which, especially in the winter, blows down the Rhone Valley and can reach over one hundred kilometres an hour. However, don’t complain about it – no wind, more rain! Nevertheless, Provence loses out to Languedoc in the ‘all-year-round hiking stakes,’ so those looking to hike late Autumn and throughout the winter months should consider first and foremost the Garrigues and Gard Provence.